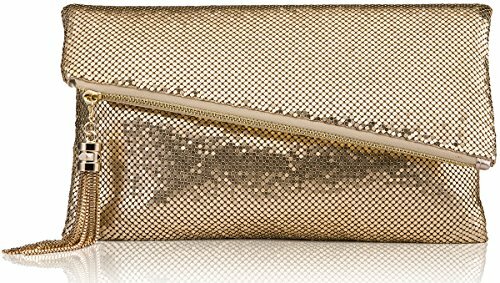 This womens envelope evening clutch may be the must have fashion accessory for the perfect night out. it's elegant but not too flashy. this clutch purse features a foldover flap with a asymmetrical edge that brings you right to the forefront of fashion. Unfold the flap and unzip the opening on the flap's edge, you'll find a fabric-lined interior with deep main compartment and 1 zippered pocket to help keep your belongings organized. ♥Stylish Design, the deep main compartment folds over to make this a standard clutch. ♥This bag has large room for your essentials, and the different compartments will help to keep you organized. ♥ LIGHTWEIGHT AND COMFORTABLE, this evening purse only 0.5 lb (0.25 kg). Use sponge as interlining material between the metal mesh and the satin lining, make you comfortable to carry it. ♥ GREAT PACKAGED, will comes with a nice box for you to keep it. If you have any questions about this product by ROVOYCE, contact us by completing and submitting the form below. If you are looking for a specif part number, please include it with your message.